After trying several sliders for my church’s website, I settled upon this one. It is extremely versatile and has great customization. I am very thankful toward these good people for the great slider and great support. Wow! This is a great slider! 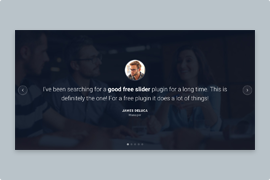 I’ve used many different slider plugins, free ones and premium ones. I just started using Smart Slider 3 and I am very impressed! It’s very user friendly and has many of the features of the best of the premium sliders. To name just a few of it’s features, it has layers, it has custom designed responsiveness and preview. 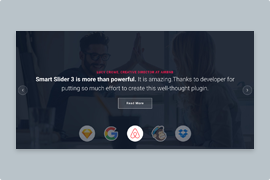 I already knew that Smart Slider 3 was the most customizable, responsive, easy to use slider available, even in its Free form and I’ve tested over a dozen of the “best” sliders out there based upon # of active installs as well as magazine or blog recommendations. So so easy, even fun to use! Incredible flexibility across multiple devices, plus excellent device detection – it means reliable mobile and tablet rendition, exactly how you want it. The backend has lots of options to customize many elements of a slider. Don’t count on using shortcodes inside the slider though without some work arounds or custom code changes. Overall, it’s a great slider. My fav feature is the parallax effect. Support was very responsive to my questions. 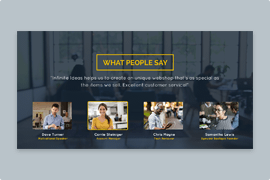 Description: Encourage your visitors to browse more tesimonials usign this stylish showcase testimonial slider. The success is guaranteed! Fancy sliders and colorful images might not suit all websites. 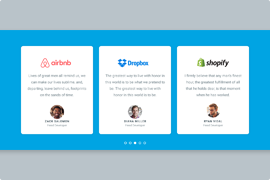 The Testimonial Showcase slider is a great choice to show customer feedback when you need something simple. The color palette contains mostly light colors, like the gray slider background color. The button and bullets have the same color, which encourages visitors to take action. They’re both green, which stands out and makes them noticeable. This slider does not have customer avatar, but it has a nice title instead. This title summarizes the testimonial text and highlights what they like the most. What’s the best part of this slider? It displays three slides at a time. The active slide is in the middle. On its right and left side there’s the next and previous slides respectively. This makes it clear for visitors that there are more testimonials to read. The slides switch with a nice animation, which fits the slider perfectly. The other colored element is the star rating at the top right corner. This rating shows how satisfied the customer is with the product or service in a visual way. This visual display highlights the rating and helps to build trust. Right next to the customer’s name there’s a date, which shows how up to date their testimony is. This helps showing how trustworthy the product or service is. For instance, if there’s lots of recent good reviews that means the quality is still high. The mobile behavior of this slider is special. Instead of displaying the whole testimonial text, it shows the title, name, rating and a button. The button has the Read More text on it, which encourages the visitors to go and read the full testimonial. This practice helps to keep the slider height small. Not having to scroll through a long slider improves the user experience. The fraction of the next and previous slides show still, but the bullets are hidden. The mobile visitors can switch slides by swiping left or right.